Now before we dive into a full bullet list of reasons, let me explain the reason for this article. Sites like Wix, Squarespace and Shopify are some of the more popular ones these days. But, we specialize in WordPress consultations, designs, development, and optimization because we truly believe it’s one of the most flexible web platforms, one of the easiest for the end-user to build and manage content strategies from, and one of the most powerful CMS sites to build strong brand, content, and SEO strategies with; if setup properly. Since WordPress can really handle anything from a simple blog to a company site sized for 1000’s of employees, and since major brands like Facebook, LinkedIn, Sony Music, Vogue, Samsung, TechCrunch and Dole rely on WordPress for their news and blog content management, WordPress (self-hosted site design options) is typically the go-to strategy for the vast majority of Back2Basics clients looking to build a new site from ground-up, or who may need to get a better handle on their current content strategies. For the sake of this breakdown, we’ll be comparing WordPress self-hosted website designs vs. another self-builder template product like Wix or Web.com. Pricing vs Control – I’m sure you’ve heard the old adage, “You get what you pay for”? Well, this could not be more true than when it comes to most website designer tools or resources.When you develop a website on WordPress and host it with a server provider of your own choice, you have control over the property of those website files. In other words, you own those assets outright and have the choice to move them to another server host or work with another website developer or web manager if you so choose. When you work with an “all-inclusive” agency that’s not always the case. In fact, it’s rarely the case. For example, if you took the time to set up a do-it-yourself site in Wix.com or selected the “free” website builder with Web.com, but then decided you wanted to move your site to another web host provider, or cancel those Web.com marketing services you subscribe to with your free site… you lose the site and the site content. You’re starting all over. And, with prices ranging from $30 for a WordPress theme, (plus your blood, sweat, and tears to get all of your content set up and published, and your hosting costs), to a $30K uber-customized site design (developed for the needs of the elite medium sized business), and everything in between – there’s a WordPress site option available for most any small business or non-profit need. 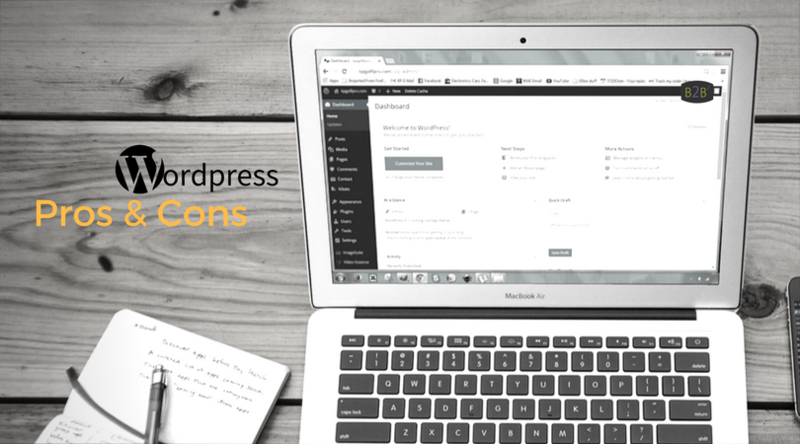 Ease of Development – With a number of WordPress-optimized hosting options that provide a one-click installation solution, and multiple drag-and-drop theme options available, you’ll be able to find options that cater to the novice. But, learning curves for the extreme novice may be better suited on a Wix.com for those do-it-themselves consumers in the beginning. But, again, be warned, if you need to hire someone to help you with customization of the site anyway, you may want to consider a platform that gives you more control over SEO strategies, layout options, and ownership of the asset long-term. Ease of Use – It’s true, beyond creating and publishing a basic blog post, many users who are not familiar with WordPress theme structures may find it challenging to use custom theme applications, tools, and resources on the backend. So, for the very novice looking to take on the setup of a website themselves, they may want to look at something like a Wix product. But, with that said, a little research can go a long way. There are several low-cost options that can provide a stronger long-term solution and still provide easy to use backend applications. And, if you plan on hiring a professional to help with set up and customization services anyway, then consider building on a solution that will give you more control long term. A good WordPress website design professional can customize the backend of WordPress to be even more intuitive for the end user. Custom SEO solutions – WordPress websites give you the ability to integrate additional plugins designed to help aid in SEO strategies. So, does Wix.com and Web.com. Both offer SEO solutions to expand content strategies beyond meta descriptions or Google verification integrations, but WordPress provides even deeper access for SEO customization you won’t find in templated sites that neither you or your web developer have access to. I’m talking about customization of page URLs, image alt tags, schema or JSON integration. Although content is still the foundation of creating and expanding brand authority for a business, these additional on-site optimization abilities are extremely important to the success of your content reach in the SERPS, and they are not available to users of site builders like Wix.com, GoDaddy or Web.com. Security – It’s well known that WordPress is one of the hardest hit platforms by virus bots and hackers, but few people read behind those headlines to learn more about those numbers. If we look at the top 3-4 CMS solutions on the market today, we’ll see that WordPress claims about 58.4% of the market share since March 2016, and is actually powering over 26% of the web! And, of that share, WordPress offers over 3000+ theme options and over 44 thousand plugins on the market. Because it’s open source and relies heavily on other themes, plugins and software authors it does undergo a large number of updates each year in comparison to its competitors. And, here in lies the problem; not because of these updates, but because the majority of these updates go unnoticed or unattended to by the website owner. The truth is, the vast majority of security risks can be overcome by routine security monitoring and maintenance. Additionally, working with website hosting/server solutions that specialize in WordPress websites often provide additional security solutions. Site Speed – Because WordPress sites contain more generic code than is necessary for every website, loading times can become stressed. It’s important that the theme design or code customization is optimized to help reduce these challenges. Lazy loading features and image compression techniques (or plugins) can often offset this challenge. Additionally, optimized server settings (such as cache clearing and database scrubbing) can reduce load times. So, again, working with a hosting partner that specializes in WordPress can help provide you these solutions and ease these concerns. At the end of the day, you have options with self-hosted WordPress that you may not have with structured hosted sites controlled by the author. eCommerce Options – Whether you’re looking to create an informational brand, a consulting business, are selling services or tangible products, WordPress has the versatility and strength to handle it all. And, with eCommerce platforms, themes and plugins from strong developers like WooCommerce, iThemes Exchange and Shopify integrations, you have something just as strong and powerful as an eCommerce specific website service platforms such as Magento, Shopify, or Squarespace. If you’re looking specific for a product sales portal, have no need to create or expand brand awareness, and will be foreseeably moving extreme quantities of multiple categories of inventory, you may want to consider a ‘traditional’ e-commerce shopping cart platform. However, WooCommerce is robust enough to handle some of the most complex e-commerce sites and has been used by some of the most noteable brand names in the market today; brands like Vic Firth, Airstream USA, Kinfolk, Ripley’s Believe it or Not, and MensHealth. Small business owners can no longer afford NOT to have a website in today’s business climate. At the end of the day, websites are no longer an optional marketing strategy, but rather a must have business asset; no matter the size of the business or the type of business. If you own a business or provide business solutions, your potential consumers expect to be able to find you on on the web, and learn about who you are and what it’s like to work with you. A company or business website provides a sense of legitimacy for small business owners. At the very least, the website will provide a digital billboard about the business’s products and services. But, beyond legitimizing a small business, the website provides digital “proof of quality” of your products or services, and “reinforces expertise” by providing a platform consumers can reference your business and use to share their experiences with other potential consumers. Although larger, or more complex websites can require a large financial investment, the majority of small business owners or small non-profit managers are able to have a more affordable website developed by starting with a basic design they can strategically grow over time as the business grows. And, WordPress website design solutions are perfect for this type of strategy; keeping costs down long-term, while providing you the flexibility of change and growth. As a business owner, you have to decide the purpose of your site and what that’s worth to your business long-term. Is this tool to help establish your brand in the eye of potential consumers, a way for you to expand sales of your products and/or services, a platform to use to expand your brand authority by showcasing your expertise, or a way to provide additional consumer resources for existing clients. Once you have those objectives laid out, the rest will fall into place, and a WordPress website design can help you achieve those goals with a little strategic thought behind the design. Here are some additional content resources on the subject. Check out this great Infographic comparing some of the top CMS site platforms today at MakeaWebsiteHub.com. Learn about how to Select the Best WordPress Website Hosting Option for your web hosting needs. How do you tackle Website Optimization through Content Strategies? Take a look at this surprising list of WordPress users provided by CodeInWP.com. IF you’re looking for a new website, need to redesign an existing site, or if you would like to discuss your current website performance and strategies for expanding online exposure, contact Back2Basics today.